Parents across the UK and in fact around the world will understand that having a baby requires a financial commitment towards accessories that you need whilst your baby is growing up. One particular item that is especially important for many parents is a changing table yet choosing the right changing table is dependent on the following factors. In this fast-paced lifestyle that many new parents often live in the need to travel from one place to another with your newborn baby is quite common. This has consequently created a need for mobile changing tables that offer convenient transportation and ease of use whenever a baby needs to be changed. A mobile changing table is usually constructed of lightweight and durable plastic that can be folded and stored away in a car or even behind a pushchair when out and about. They may even come with convenient storage space such as drawers or under-trays for you to store all of your baby’s accessories. 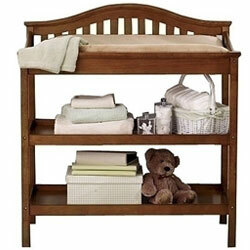 Do you require something that looks good in a nursery or simply something that is easy to use? As you can probably imagine there are many changing tables available for you to use within your home and one particular example is the dresser style table. This type of table is usually constructed using heavy duty and durable wood meaning that it will typically last for not only the duration of your baby’s nappy years but once your baby does indeed grow out of nappies then you simply convert it back into a standard dresser that can be placed in your own room or in the toddlers nursery. Do you suffer from a physical disability? If you suffer from a physical disability or maybe even back pain, luckily for parents there are actually wall mounted changing tables that allow you to adjust the height using mechanical, hydraulic or electrical operation. Whilst these do cost a considerable amount of money with many running into thousands of dollars they are extremely easy to use and can also double up as a wash-seat in the shower room. This is perhaps one of the most important aspects of choosing the right changing table and quite obviously your budget will determine the particular manufacturer of the changing table that you choose. If you are in the market for a changing table you must keep in mind that is not necessarily the price that will get you a good quality table but more to do with your specific requirements and lifestyle if you are to find a suitable unit. Remember that the main factors that you need to consider when choosing the right changing table for you and your baby must be particular to your lifestyle and the way in which you plan to use the table. As already mentioned, if you plan to travel a lot then ensure that you purchase a good quality mobile changing table as the benefits certainly do outweigh the cost. On the other hand, if you're looking for something perhaps more permanent then certainly consider the dresser style changing unit as already mentioned.